75 Fast Plant-Based Meals You're Going to Crave! 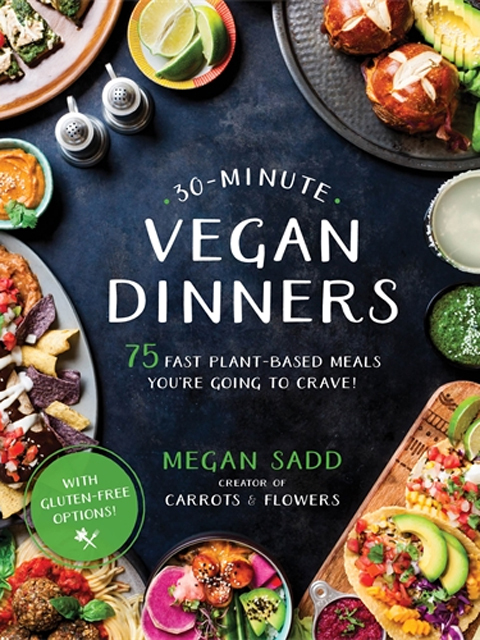 Whether you're committed to a vegan diet or simply looking to enjoy more plant-based meals in your dinner routine, this cookbook is a must-have weeknight resource. Megan Sadd, founder of the vegan food blog Carrots and Flowers, which has nearly 280k likes on Facebook, shares 75 new and amazing recipes that work on multiple levels for busy home cooks. Each recipe is kid-friendly and easy to prepare, featuring easy-to-find, real-food ingredients and no highly processed meat or dairy substitutes. Most recipes are gluten free, or include a gluten-free option. Many are also made in one pot, making for less cleanup and fuss. Readers won't groan at the thought of preparing dinner after work when they have such quick, easy and delicious options as Cauliflower Romanesco Tacos, Dynamite Poke Bowls, Salisbury Portobello TV Dinner, Creamy Pesto Quinoa with Roasted Tomatoes and 20 Minute Vegan Mac 'n' Chz. Before you know it, you'll be whipping up nourishing, nutrient-dense, feel-good dinners every night of the week like you were born for it! There will be 75 recipes and 75 photos. Megan Sadd is the founder of the vegan food blog Carrots and Flowers. She has nearly 280k followers on Facebook and 35k on Instagram. She lives in Los Angeles, California.